“To prevent all disputes about the place and time of my birth, be it known that I was born on June 14, 1726, old style, in the room now called the yellow room that the celebrated Mrs. Clayton, of Shrewsbury, ushered me into the world, and delivered me to Miss Jenny Parry, of Mem, in this parish who, to her dying day, never failed telling me, ”Ah you rogue! I remember you when you had not a shirt to your back." at Downing, in Flintshire, the seat of his family for several generations. He was the son of David Pennant, and his mother was the daughter of Richard Mytton of Halston. He was educated first at Wrexham, then at Mr. Croft’s school at Fulham, and last at Queen’s and Oriel colleges, Oxford, where, however, he took no degree, but was complimented with that of LL.D. in the year 1771, long after he had left the university. Previous to this resignation, however, in 1754, he visited Irelnd but such was the conviviality of the country, that his purnal proved as meagre as his entertainment was plemtul, “so it never was a dish fit to be offered to the publtk.” In 1756, he published in the “Philosophical Transations,” a paper on several coralloid bodies he had colleced at Coal brook- dale, in Shropshire. In 1757, at the insance of the celebrated Linnæus, he was elected of the Real Society at Upsal, which he calls the first and greatest of his literary honours. He kept up a correspondence with Linna3us, till age and infirmities obliged the!atte to desist. In 1761, he began his “British Zoology,” which, when corroletec, consisted of 132 plates on imperial paper, all engraved by Mazel. Edwards, the celebrated ornithologit, conceived at first a little jealousy on this attempt, but t very soon subsided, and they contracted a great intimcy, which ended only with the death of -Mr. Edwards. 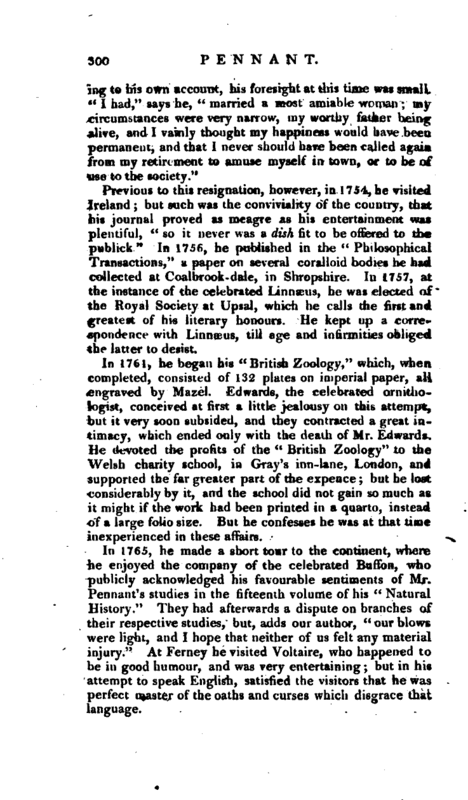 He Jevoted the profits of the “British Zoology” to the Welsh charity school, in Gray’s inn-lane, London, and suported the far greater part of the expence; but he lost coniderably by it, and the school did not gain so much as it right if the work had been printed in a quarto, instead of darge folio size. But he confesses he was at that time inexperienced in these affairs. In 1765, he made a short tour to the continent, where he enjoyed the company of the celebrated Buffon, who pubicly acknowledged his favourable sentiments of Mr. Tenant’s studies in the fifteenth volume of his “Natural Hislry.” They had afterwards a dispute on branches of thei respective studies, but, adds our author, “our blows werdight, and I hope that neither of us felt any material inju” At Ferney he visited Voltaire, who happened to be in good humour, and was very entertaining; but in his attempt to speak English, satisfied the visitors that he was master of the oaths and curses which disgrace that language. | During this tour, Mr. Pennant visited also baron Haller, the two Gesners, the poets, and Dr. Trew, a venerable patron of natural history, who resided at Nuremberg. At the Hague, he met with Dr. Pallas, and this meeting gave rise to his “Synopsis of Quadrupeds,” and the second edition, under the name of the “History of Quadrupeds,” a, work received by the naturalists of different parts of Europe in a manner uncommonly favourable. Mr. Pennant had proposed this plan to Pallas, but owing to the latter being promoted at the court of Petersburgh, it ultimately de* volved on himself. In 1767, after his return, he was elected fellow of the Royal Society. In 1768, his British Zoology was published in two volumes, 8vo, and the bookseller gave Mr. Pennant lOOl. for permission to do so, which he immediately vested in the Welsh charity-school. In 1769, he added a third volume, in octavo, on the reptiles and fishes of Great Britain. 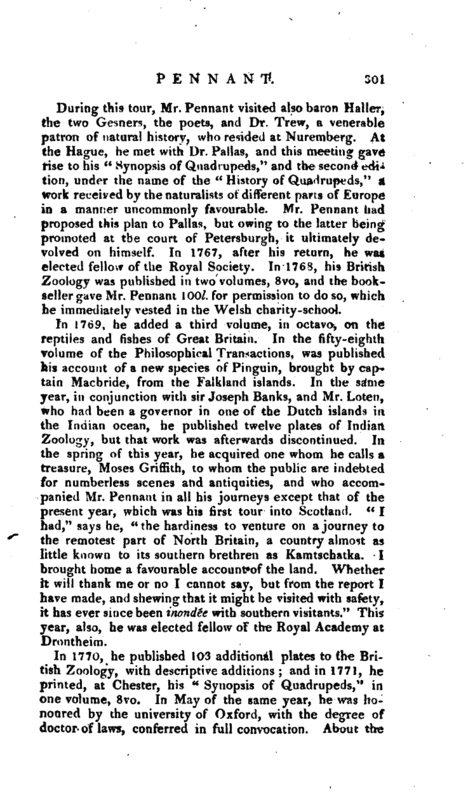 In the fifty-eighth volume of the Philosophical Transactions, was published his account of a new species of Pinguin, brought by captain Macbride, from the Falklantl islands. 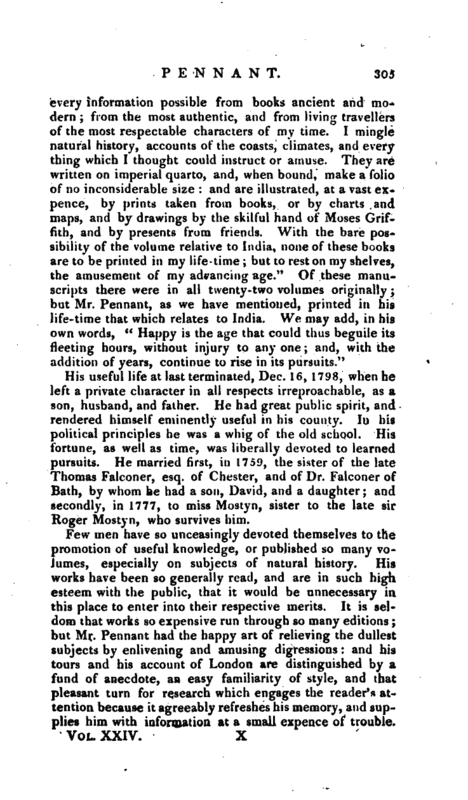 In the same year, in conjunction with sir Joseph Banks, and Mr. Loten, who had been a governor in one of the Dutch islands in the Indian ocean, he published twelve plates of Indian Zoology, but that work was afterwards discontinued. 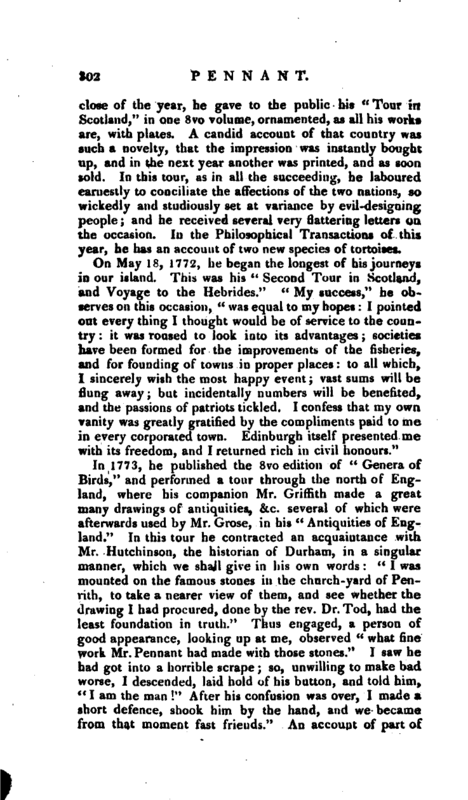 In the spring of this year, he acquired one whom he calls a treasure, Moses Griffith, to whom the public are indebted for numberless scenes and antiquities, and who accompanied Mr. Pennant in all his journeys except that of the present year, which was his first tour into Scotland. “I had,” says he, “the hardiness to venture on a journey to the remotest part of North Britain, a country almost as little known to its southern brethren as Kamtschatka. I brought home a favourable account of the land. Whether it will thank me or no I cannot say, but from the report I have made, and shewing that it might be visited with safety, it has ever since been inondZe with southern visitants.” This year, also, he was elected fellow of the Royal Academy at Drontheim. lu 1770, he published 103 additional plates to the British Zoology, with descriptive additions; and in 1771, he printed, at Chester, his “Synopsis of Quadrupeds,” in one vbiu n’e, 8vo. In May of the same year, he was honoi.-ed by the university of Oxford, with the degree of doctor of laws, conferred in full convocation. About the | close of the year, he gave to the puhlic his “Tour in Scotland,” in one 8vo volume, ornamented, as all his work* are, witii plates. A candid account of that country was such a novelty, that the impression was instantly bought up, and in the next yoar another was printed, and as soon sold. In this tour, as in all the succeeding, he laboured earnestly to conciliate the affections of the two nations, so wickedly and studiously set at variance by evil-designing people; and he received several very flattering letters on the occasion. In the Philosophical Transactions of this year, he has an Account of two new species of tortoises. In 1773, he published the 8vo edition of “Genera of Birds,” and performed a tour through the north of England, where his companion Mr. Griffith made a great many drawings of antiquities, &c. several of which were afterwards used by Mr. Grose, in his “Antiquities of England.” In this tour he contracted an acquaintance with Mr. Hutchinson, the historian of Durham, in a singular manner, which we shall give in his own words: “I was mounted on the famous stones in the ciiurch-yard of Penrith, to take a nearer view of them, and see whether the drawing I had procured, done by the rev. Dr. Tod, had the least foundation in truth.” Thus engaged, a person of good appearance, looking up at me, observed “what fine work Mr. Pennant had made with those stones.” I saw he had got into a horrible scrape; so, unwilling to make bad worse, I descended, laid hold of his button, and told him, “I am the man” After his confusion was over, I made a short defence, shook him by the hand, and we became from that moment fast friends." 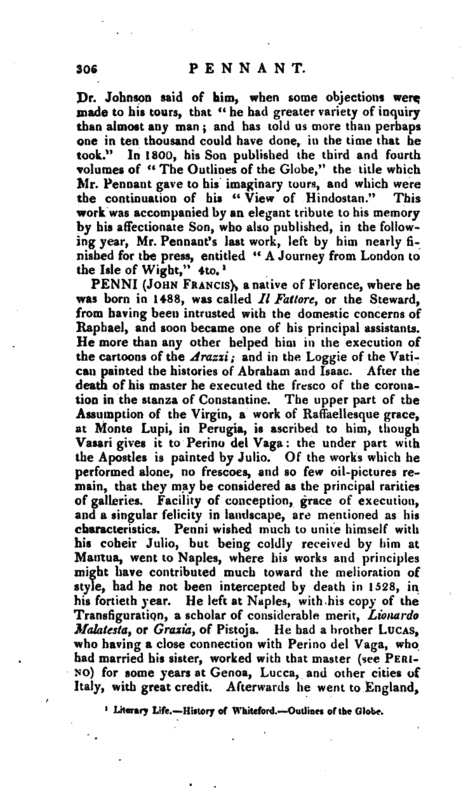 An account of part of | this journey, Mr. Pennant left in manuscript, illustrated with drawings by Mr. Griffith. Mr. Pennant performed all his journeys on horseback, and to that he attributed his healthy old age. He considered the absolute resignation of one’s person to the luxury of a carriage, to forebode a very short interval between that, and the vehicle which is to convey us to our last stage. In 1774, he published a third edition, with additional plates, of his “Tour in Scotland,” in 4to, and his Voyage to the Hebrides in the same size. In the same year, he visited the Isle of Man, and journeyed through various parts of England. In 1775, appeared his third and last volume of the “Tour in Scotland,” performed in 1772. These tours have been translated into German, and abridged in French. In 1777, he published a fourth volume of the “British Zoology,” containing the vcrmes, the crustaceous and testaceous animals of our country. In this year, 1781, he was elected an honorary member of the society of Antiquaries at Edinburgh. 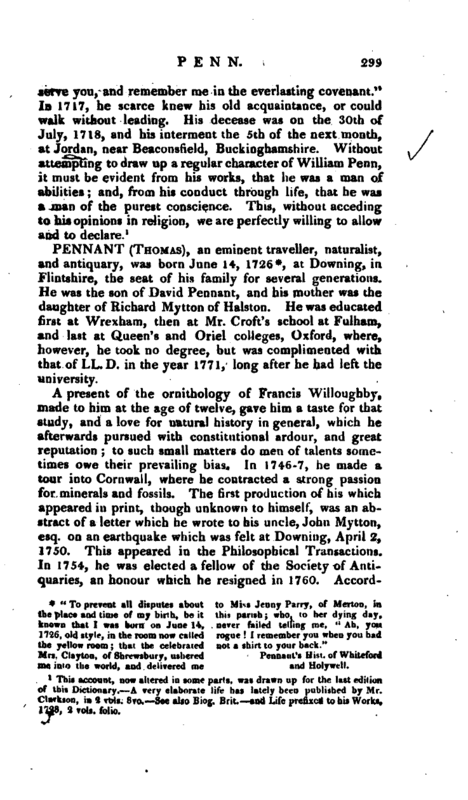 In the Philosophical Transactions of the same year, was published his history of the Turkey, which he made appear was a bird peculiar to America, and unknown before the discovery of that continent: also a paper on earthquakes felt in Flintshire. 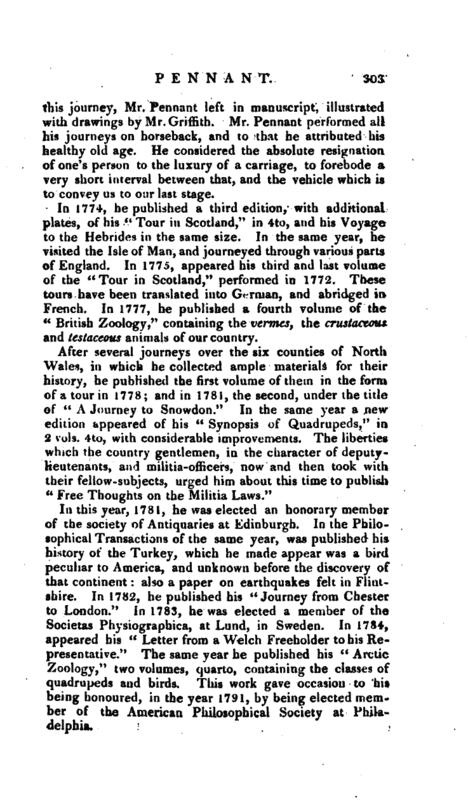 In 1782, he published his “Journey from Chester to London.” In 1783, he was elected a member of the Societas Physiographica, at Lund, in Sweden. In 1784, appeared his “Letter from a Welch Freeholder to his Representative.” The same year he published his “Arctic Zoology,” two volumes, quarto, containing the classes of quadrupeds and birds. This work gave occasion to his being honoured, in the year 1791, by being elected member of the American Philosophical Society at Philadelphia. | In May 1784, he was elected member of the ftoyal Academy of Sciences at Stockholm; and in January 1785, an honorary member of the Edinburgh Society for promoting of natural knowledge; of the Society of Antiquaries at Perth; and the Agricultural Society at Qdiam, in Hampshire. In 1787, he published a Supplement to the Arctic Zoology. As in 1777, he had again married, he discontinued his tours until the spring 1787, when he visited the dockyards, and travelled by land from Dartford, following the coast to the Land’s-end. 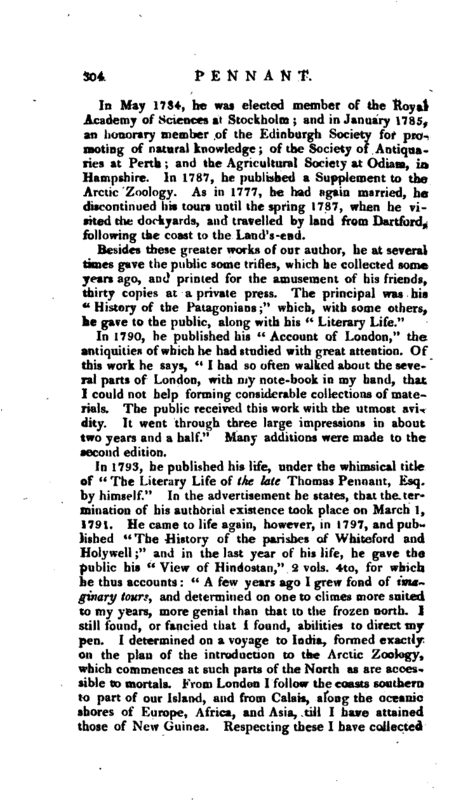 In 1790, he published his “Account of London,” the antiquities of which he had studied with great attention. Of fhis work he says, “I had so often walked about the several parts of London, with my note-book in my hand, that I could not help forming considerable collections of materials. The public received this work with the utmost avidity. It went through three large impressions in about two years and a half.” Many additions were made to the second edition. His useful life at last terminated, Dec. 16, 1798, when he left a private character in all respects irreproachable, as a son, husband, and father. He had great public spirit, and rendered himself eminently useful in his county. In his political principles he was a whig of the old school. His fortune, as well as time, was liberally devoted to learned pursuits. He married first, in 1759, the sister of the late Thomas Falconer, esq, of Chester, and of Dr. Falconer of Bath, by whom he had a son, David, and a daughter; and secondly, in 1777, to miss Mostyn, sister to the late sic Roger Mostyn, who survives him. Literary Life. History of Whiteford. Outlines of the Globe.